The Coverage Access Guide — a new educational app authored by professional case managers is designed to tackle healthcare road blocks and offer educational advice empowering the patient, caregiver and provider. HAMPTON, VA – Patient Advocate Foundation (PAF), a national nonprofit organization dedicated to helping seriously ill patients overcome healthcare barriers, has developed a new mobile phone app for Apple phones and tablets, the Coverage Access Guide: A Consumer’s Guide to Insurance, designed to answer frequently asked questions about accessing, enrolling and maintaining healthcare coverage. The Coverage Access Guide is a free, user-friendly, article-based educational guide geared to help current and future patients overcome common healthcare obstacles in order to enhance their overall healthcare experience. Advice and guidance, harnessed from PAF’s staff of professional case managers, is presented via brief articles so that novice and experienced patients alike can quickly and easily access the information. The Coverage Access Guide walks patients through the full healthcare journey from initial plan selection to making the most of their plan benefits. Additionally, heavy-hitting topics such as workplace benefits and tips to preserve income are covered. 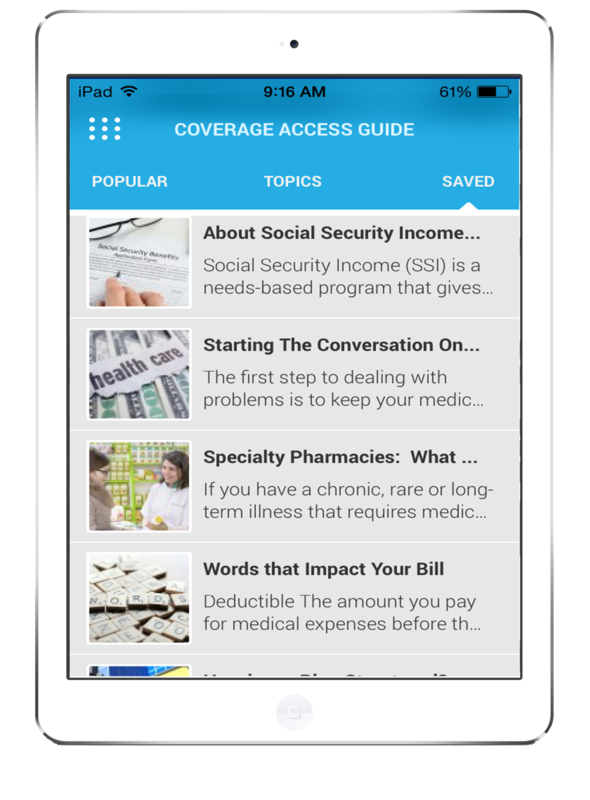 The Coverage Access Guide app provides users with seamless navigation through streamlined menu access tools, searchable keywords, topics and categories, vertical scrolling, and the ability to save articles or send them to a friend via social outlets and email. The app also allows users to increase font size for easier readability. Designed to connect patients, caregivers and providers with expert and actionable advice, the app also features a user feedback submission article request. A corresponding print guide will also be available from within PAF’s publications library. The Coverage Access Guide- A Consumer’s Guide to Insurance was made possible through an unrestricted grant from Jazz Pharmaceuticals to ensure patients make informed healthcare decisions and continue to have access to treatments now and in the future. Coverage Access Guide is available exclusively through iTunes and Apple’s App Store. The government’s latest information on public health and communicable diseases is posted here. The Lancaster Cancer Center is a proud member of the Chamber of Commerce. Straightforward general information from the American Academy of Family Physicians. A health library available in English and Spanish, sponsored by the U.S. Department of Health and Human Services. Offers online tools to help guide treatment decisions. A partnership among medical societies to foster doctor-patient communication. The National Library of Medicine’s comprehensive health-informational portal. Provides clinical details about every type of cancer and the latest treatments. A forprofit news and information service with interactive activities. There are a wide array of treatments available for fighting cancer. The following information and links are from the National Cancer Institute (www.cancer.gov) and offer patients a brief understanding of each type of treatment your doctor may prescribe. Site that helps patients and caregivers stay connected to friends and family. Basically it helps one create their own personal website. Interesting articles and a petition to sign for approval of a family caregiver US postage stamp. National health topics guide including sprituality and health. Features more than 100 articles, videos and answers to health questions. Report any negative side effects of prescription drugs to the FDA. The American Institute of Stress will give information and stress management techniques. Information on types and causes and research addressing pain management.